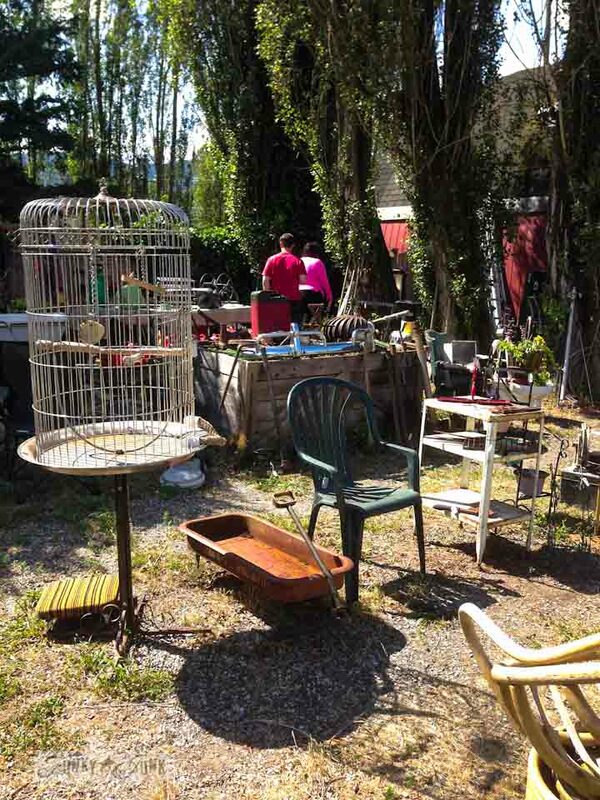 Junkin’ at Rusty’s in Harrison Hot Springs happened. AGAIN. I can’t stay away from this place whenever I’m in this area. And because we were camping there, well, it was just on the map! Or mine anyway. Not so much my son’s. 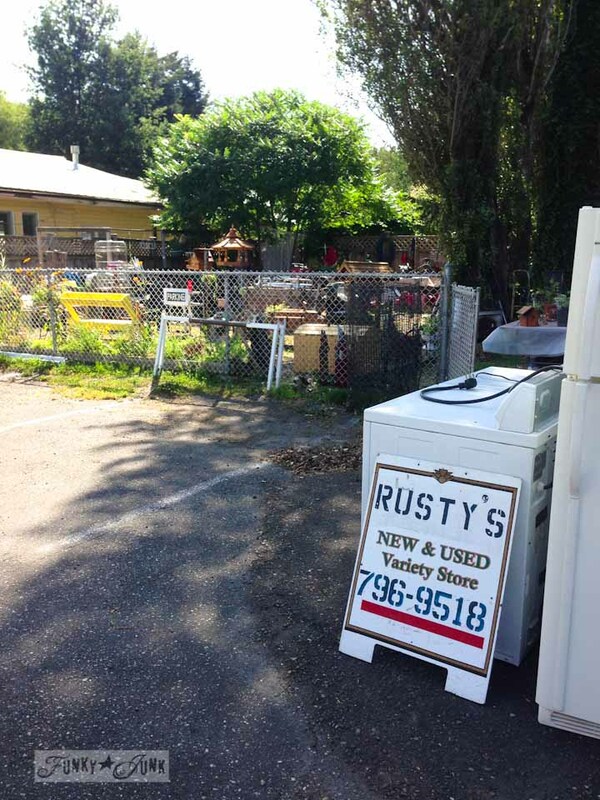 He got a chocolate / caramel covered apple for his patience after this so he made out ok.
Here’s my last Junkin’ At Rusty’s post with that storage locker EVERYONE wanted. Visiting Rusty’s is kinda like visiting a junk graveyard in a good way. There’s a true mix of 100% certified JUNK as well as valuable antiques. But I always gravitate towards the pure junk. You are forced to use your creativity to make it into something so I suppose that’s the grab for me. Actually, let’s do one better. I’ll number each picture so if you’d like to play along in comments, please do! What would you do with…. Yummy! This rusty old jack was just yummy! But goodness it was heavy. If it’s heavy, I decide how badly I want it, because if I’m gonna break out in a sweat over a piece of junk, it better have a home before I get it home. I thought with the right drill, this would have made one cool lamp base! But I also didn’t have the right drill either. And sweating wasn’t #1 on my list for the day. So it stayed. I have NO idea what this metal thing is on top of the toolbox but I gather it may have something to do with an outdoor laundry line. Maybe. Dunno! But if it were mine, I’d use it to somehow mount a light or hanging plant. All the nooks and crannies are cool! I don’t think this was all that old, but this folding table base was cool. I loved all the lines. I’d create a neat top for it maybe out of an old sign or checkerboard and totally utilize the fact that it folded down when desired. 4. Wood burning fire place beast. This wood burning fireplace of a beast was tempting. I’d have LOVED to completely rust out this guy and use it for a controlled outdoor fire pit. It would look equally cool as a garden feature with flowers growing out of the opening, or as a fountain. Sweat gauge… 5000000 out of 10. Pass. Too much sweat for being on holidays. Frosty blue and white! I loved the inside so much! Why don’t new fridges look this cool any longer? Fridge people, I like this! 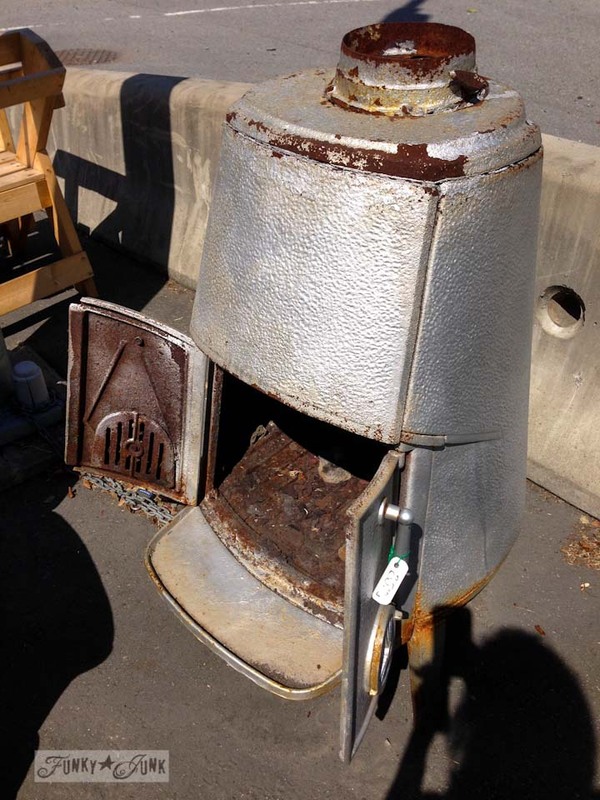 I laughed out loud when my eyes ran over this vintage washing machine. 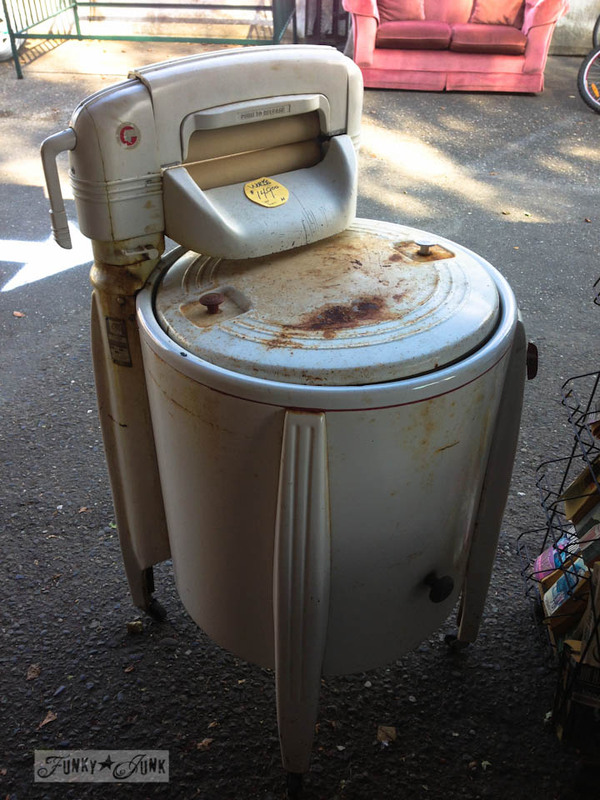 I blogged about a similar washing machine that use to belong to my grandma’s HERE. Another family member came forward that wanted it more than I so I happily let it go. But I looked this thing over and I’m telling you, it would have been fabulous as an outdoor planter or even cooler as a water fountain. This one had less of a jetson look to it. It was downright pretty! … then again, this one came equipped with a jet pack of a rusty wheel! Cool, no? ‘Fraid not. 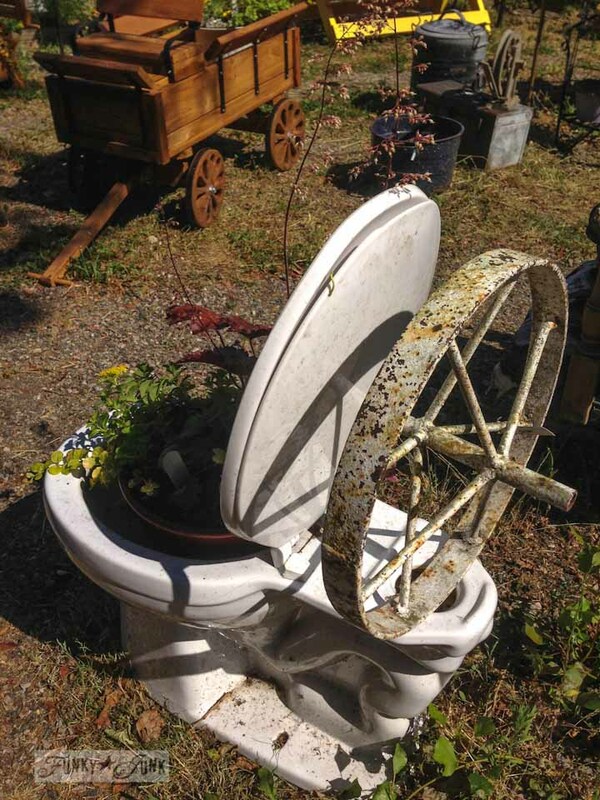 But admit it… the wheel racked up this toilet coolness one notch higher. 9. MASSIVE BIRD CAGE. Worth yelling about. This birdcage was MASSIVE. I’ve never seen anything like it. And I’m not even quite sure what I’d do with it. I’m stumped. What would you do with this thing, other than add a new room to your house to display it in?! 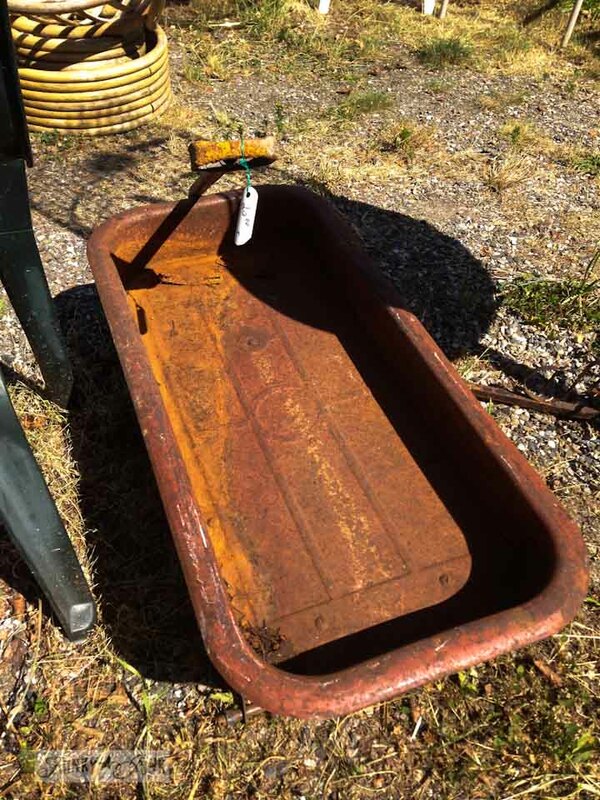 A rusty wagon would always find a place at my place. Funny thing is, this one had no wheels. 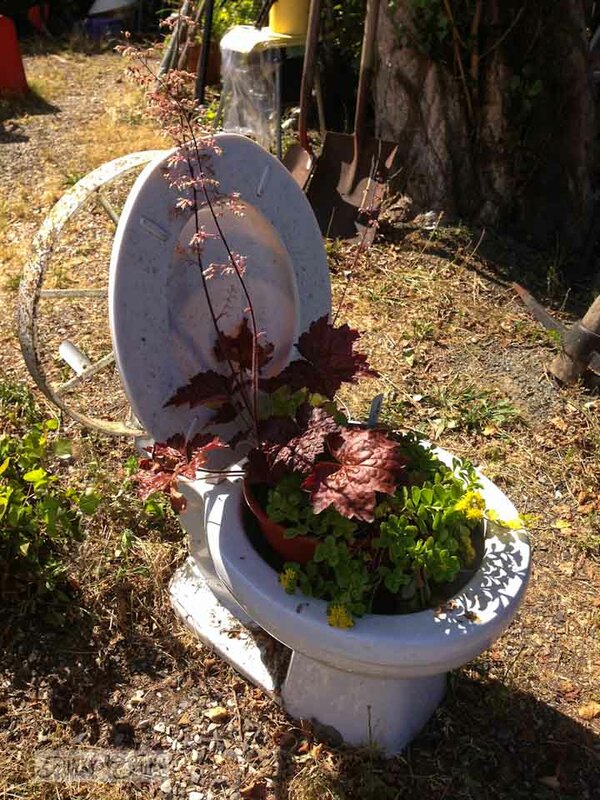 Hmm… I’d totally use it in the garden anyway, maybe as a tiny pond feature. Or create a side table out of it after giving it a good clear satin coat of sealer. Or add tetanus shot to my shopping list. Always use a good sealer when lugging something like this home. 11. White metal side table. I admit, I wanted this metal 3 shelving side table on wheels. Super cool. It wasn’t as sturdy as I would have desired though otherwise it would have come home with me. I think after it was cleaned up, it could have made a really neat side table in a bedroom due to the height. I also see this as a neat plant stand on top with plenty of storage for magazines in front of a picture window near a sofa. Or an office help. Or bathroom storage. Or workshop helper. I think it was just there to tempt me. I held strong. 12. 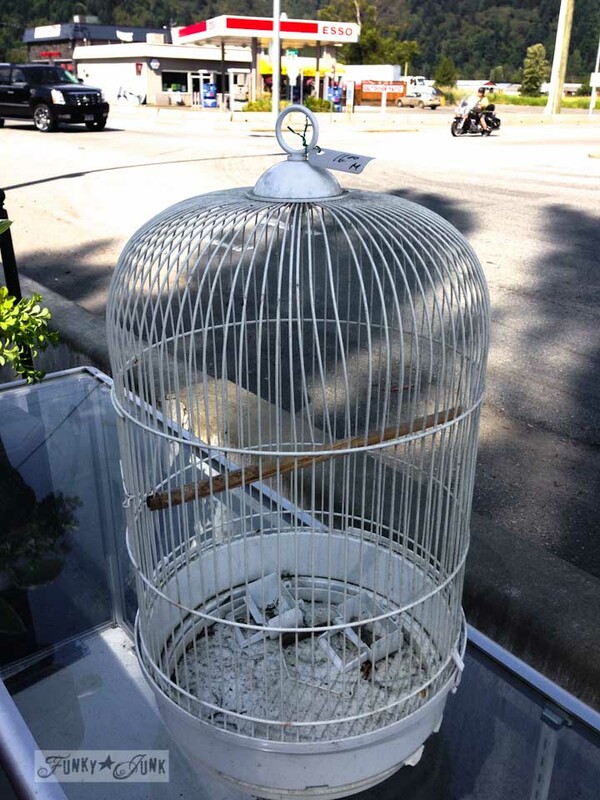 Smaller white bird cage. Another birdcage but much smaller this time and in white… I’d love to have revamped this into an outdoor patio light of some kind. 13. Chippy white gas can. This white chippy gas can would have made the perfect lamp base. After a very very good scrub that produced lots of sweat. Anyway, here’s the list in case you want to cut and paste and play along… what would you do with this stuff? 10. The Tetanus Shot Rusty Wagon. 1. Yummy rusty jack. – All I could think of was a plant stand or the center base of a table (that will never get moved – LOL). 2. Metal… metal thing. – I would put it on a post & put a hanging plant from the pulley. 3. Folding table base. Loved your idea, or lay some rough sawn or pallet wood planks on top for a rustic table. 5. Vintage fridge. ~ What a great looking fridge & I’m with you on making the insides of the ones today looking this pretty again. No ideas otherwise. 8. Rusty wheel. ~ I have one of these rusty wheels (even rustier) hanging from the middle of a split rail fence. 9. MASSIVE BIRD CAGE. Worth yelling about. ~ AWESOME! Since it’s huge, I’d put 3 floor standing candle holders with battery operated (with a remote) candles on those & have it in a corner of a patio or deck. 10. The Tetanus Shot Rusty Wagon. – Hang it sideways on the side of a building, like a shadow box, holding other rusty treasures for display. 12. Smaller white bird cage. ~ I have had one that I’m saving as a birdcage light fixture already. 13. Chippy white gas can. ~ Add a vintage-like graphic to the front & maybe use as a silk flower vase. And here I didn’t think I’d come up with ideas for that many of the items listed. 😉 Hopefully, I’ve inspired you enough to go back and get a few of these pieces! That looks like a fun place to shop! 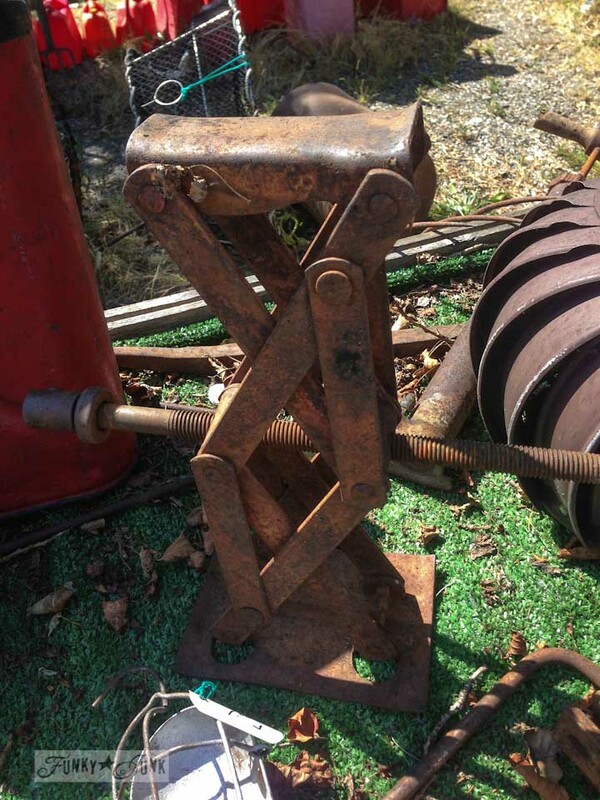 I think the rusty jack would make a great industrial lamp. I’d put the heater in the garden with plants coming out of it. #3 Folding Table – I like your idea about painting a checkerboard on top. This would be perfect for your camper since it folds up .. then when you are at the campground you can pull it outside and play games, eat a snack, etc. Ooooh, love your idea! My sister camps alot and that would be perfect for her. Would love to redo the top on one. Gonna have to keep my eye out for one now! 9. bird cages — saw yesterday where someone used a birdcage attached upside down on the ceiling, with light inside. Looked REALLY cool ! 10. wagon w/o wheels. have seen these mounted on wall with small boards as shelves. So cute !! I would have had to leave with at least three of these items ! You’ve got willpower, Donna ! #1- yummy rusty jack– I absolutely see with a mail box affixed on top…it would make a great ‘stand’ for one!!! Like Beth, I was thinking #1 would make a cool table base of some kind. My first thought when I saw #4 was flowers coming out the mouth looking part and the top. The wagon wheel would be cool in a garden with morning glory running all over it. Or as a mailbox base or as part of a table. Hmmm, lots of ideas on that one. The rusty wagon was pretty neat too. Loved your idea of making it a water feature… Too much work for this gal though! By the way, I’m new to your blog and love it! 1. Yummy rusty jack. ….WHO NEEDS A DRILL…JUST STICK A CHUNKY CANDLE ON TOP! 2. Metal… metal thing. … I think mounted like a farm light over my porch with hanging lamp would be cool. 3. Folding table base.– a table same as you, and totally Rock the folding factor! 4. Wood burning fire place beast.–I like the idea of an outside fire pit. We’re outside all year long even some winters. This would make a great heat source when working in the yard. 5. 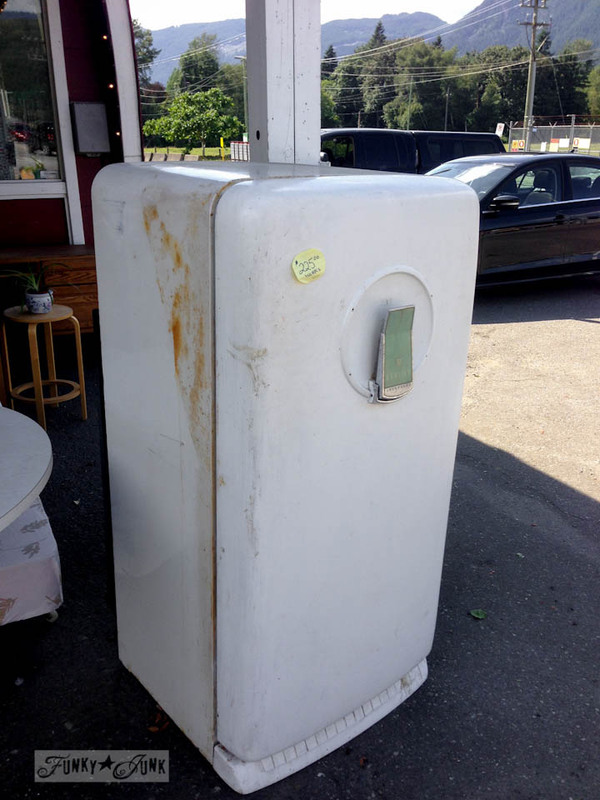 Vintage fridge.—Had one years ago. Worked like a champ. If I still had mine, I’d use it for Cold Drinks on the back porch–POOL DAYS! 6. Vintage washing machine.— COLD DRINK / BEVERAGE BOX FILLED WITH ICE. 8. Rusty wheel.—I’d like to mount that on a pole and use it as a gusset for my mailbox. I’d love to have a rusty wheel mail-box holder. 10. The Tetanus Shot Rusty Wagon.–put some pallet wood SHELVES inside it and mount it on the wall as a shelf …for other rusty items. 11. White metal side table.—I need a bedside table. Bedside table. 12. Smaller white bird cage.—Oh! I’d cram some white Christmas lights inside that bad boy and hang it on my front porch for lighting. 13. 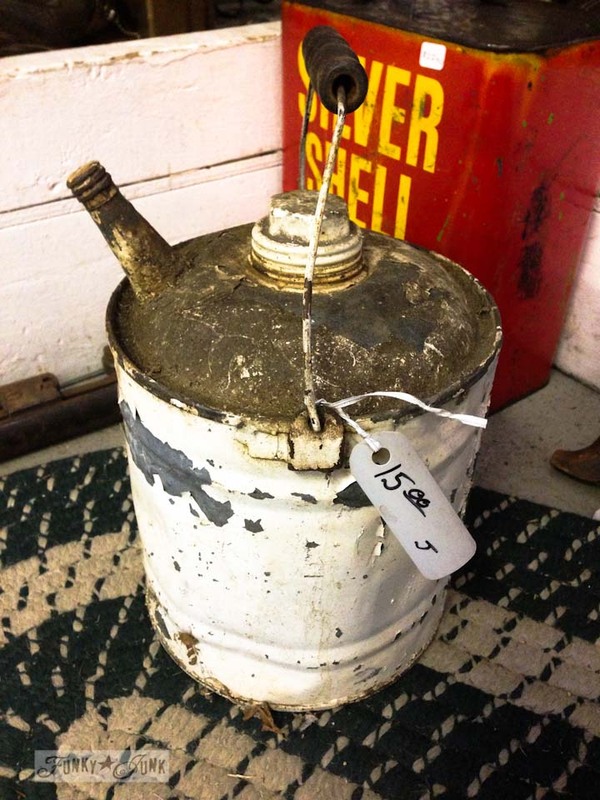 Chippy white gas can.—Due to the size of it. I’d have to attach a long pole and make a FLOOR LAMP OUT OF IT. Always be made into something. #1 A coffee table for the porch. The jack stand in the middle and use Plexiglas for the top. I would use red paint here and there on the jack stand to make certain places pop. #2 Put it in the yard for a garden hose reel. With just a little work it would be wonderful. To heavy to steal and heavy enough that the mowers wouldn’t move it! 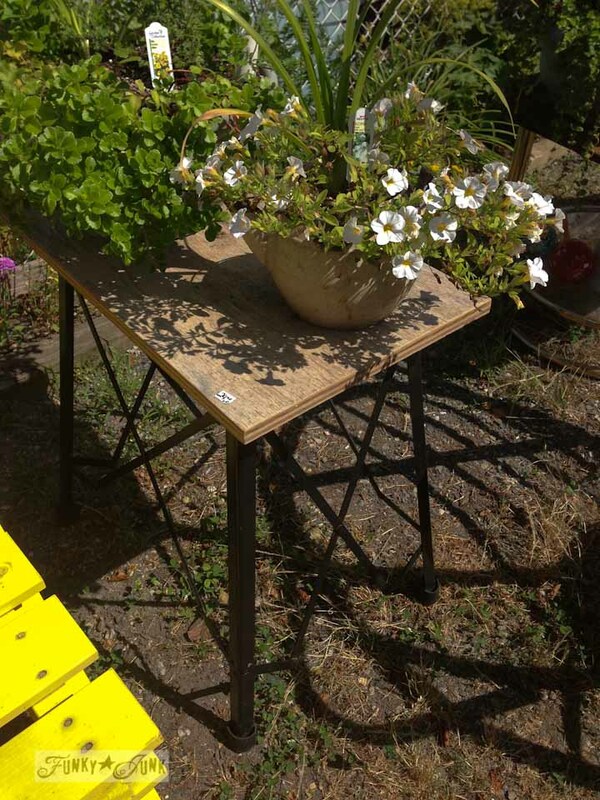 #3 Make a planting station out of it – folding and hanging on my utility building when not in use. #4 Exactly what it was mad for- But use it in the yard not inside. #5 Fridge- Elbow grease and a good fridge maintenance guy and in my dining room. #6 A flowing water feature coming out of the wringers. #7- No way hate them for decoration – I would love the wheel though. It would be beautiful with a vine running through it. #8 Use it for an address or house numbers on a wooden block made just to hold it. #9 Bird cage – again a big ol’ vine growing out of it. #10 Mount on a board to protect my walls and add shelves for bathroom displays. #11 Clean it up- Clear coat it and use in my dining room to store Canned foods on. #12 Put a big sea shell with a night light and flowers for a soft light for my porch. OOOh, I like your idea about the wagon. Gonna now have to add a wagon to my list of things I need to find. Excellent idea!! i’m re-energized, the creative juices beginning to flow. love the lenses through which you look at castoffs and stuff long discarded! Some really cool items here and great ideas as always! I would love to know what kind of sealer you use for you rusty items. I love rust…..
#1- #13: wait to see what everyone else does and build off their inspiration! With the exception of #4 – that has big Gadget Sponge birdhouse written all over it. -Rusty wheel – would be fun to use as part of a light fixture – or just propped in a corner in the garden. -Bird cages – I can see them as light fixtures as well. You’d have to have a very high ceiling. They could also be table bases – again with big chunky burl or stainless steel tops. Thanks for engaging us with your game! I agree with the other commenter who said the rusty jack should have a mailbox on top. It’s the first thing I thought of when I saw it. In my small town, sometimes the teenagers make some “fun” by driving around and batting the mailboxes. It’s not much fun for the homeowner that has to deal with a damaged mailbox and sometimes uprooted post. That rusty jack is more likely to damage the teenager’s bat (or batting arm) than be damaged itself. 13. Cut the top section off, put a circle of wood in the bottom, drill hole for drainage, screw on 3 wheelies, and then fill with pebbles, then top soil, and add plants and flowers: a planter! There is a house in my neighborhood that has wagons and wheelbarrels standing up in rows, with the handles resting on the front of house on each side of the front door filled with dirt and lots of flowers. Donna you have such a good eye and such great ideas! #1 – I agree with the mailbox idea! 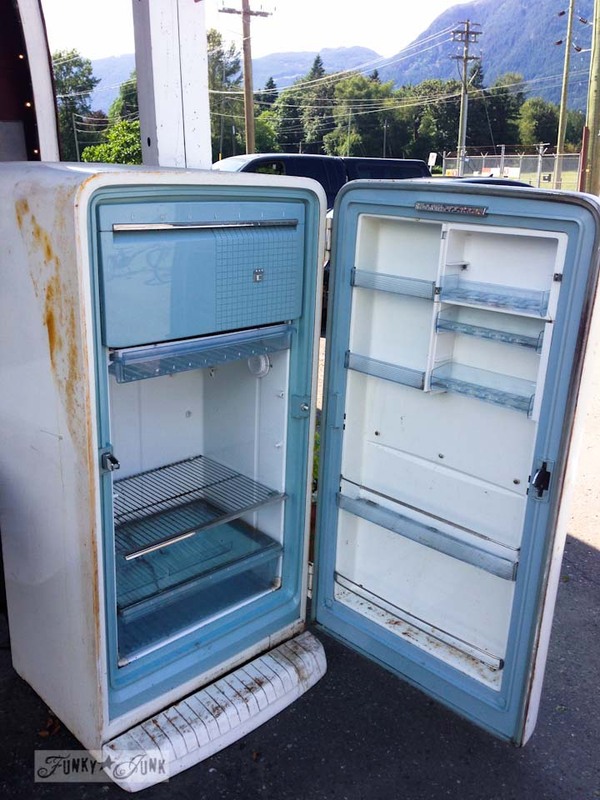 #5 – That vintage fridge is just so beautiful on the inside! It would be great to have! Any idea for it would make me happy. 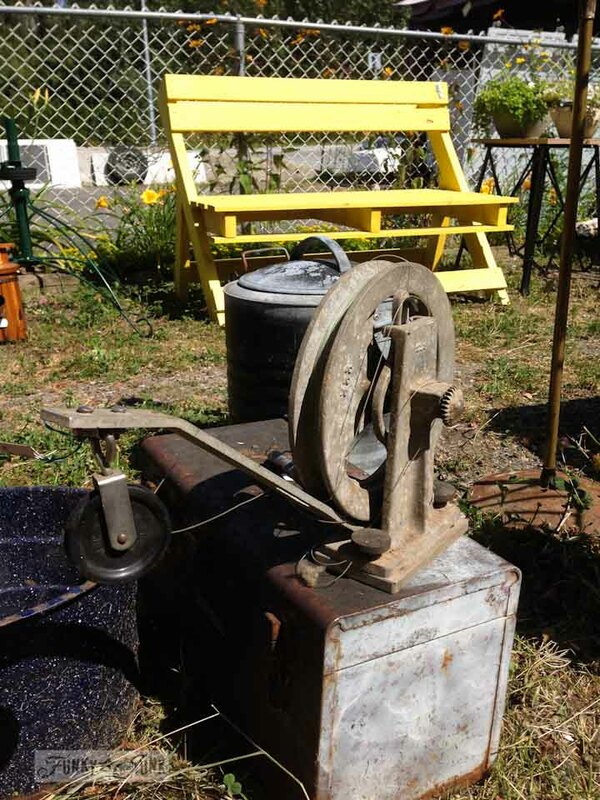 #6 – Love the vintage washer…makes me think of one my mom had when I was very young. I like the drink box idea for it! 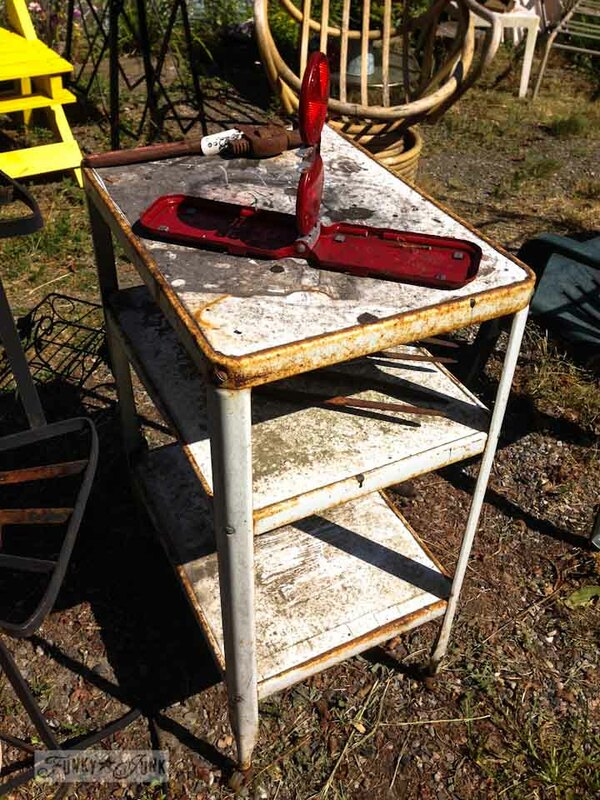 #11 – the while metal table. I think it would make a really cool bar cart! Can you tell me how much it was? One of our antique shops has one and I want to compare prices to see if it is a good deal. I just might think of getting it and make that bar cart! #1 Those are legs for a big garden bird .. if I welded! All I saw were legs 🙂 And the other metal parts could have been used for the rest of the bird! You were very good on your not shopping stop! I thought of the movie “The Long, Long Trailer” with Lucy and Desi! She collected rocks, big ones, and lots of them. That would be me, I love rocks. The apple sounds yummy! That was a good prize for patience. I am patiently waiting for your next post .. where’s my apple 🙂 Have fun! 2. Metal… metal thing.- LOL, this made me think of the pulleys that used to be used to raise hay bales to the loft of a barn. I’d mount in on my fence, add rope and hang either a lantern or planter from it. 3. Folding table base. Replace the top with pallet wood, and use it on my deck. 4. Wood burning fire place beast. Outdoor fireplace. I might even paint it Sooner Red if I could find heat-resistant paint. 5. Vintage fridge. I’d get someone to get it working, and use it to store Cokes. It would make me happy every time I opened it! 6. Vintage washing machine. Planter? 9. MASSIVE BIRD CAGE. Worth yelling about. Giant patio/yard light? Plants. Light fixture in a really big, really tall foyer. 10. The Tetanus Shot Rusty Wagon. I’d stick it in my front flower bed as is. Would look awesome with the made-from-fence shelf and bench on my porch! 11. White metal side table. Much cuter than a TV tray, this would be in my living room for snackies. 12. Smaller white bird cage. I think I would use this at Christmas, I have LOTS of white decorations. Do an evergreen something in it, or a Christmas village vingette. Aw, darn, now I have to go find a white bird cage!! 13. Chippy white gas can. On my front porch, next to previously mentioned shelves. That was fun, hope you take us shopping again soon!!! Love both birdcages! I would hang them from the trees in my yard. Maybe I would leave the door open and put birdseed in it for the cute little Chickadees! Or just leave them empty. I love the rusty thing! (#1) The very first thing to pop in my head was a base for a stool. Bolt on some casters and have fun spinning around the room. #2 Metal thing, I am really not sure what to do with it but for some reason it looks like a wheel that you use to bend pipe. ???? Just a guess. #11 White metal table- clean it up and repaint in shiny white (or favorite color) and it is a kitchen appliance cart. You can roll it out and use it or keep out for a portable island/chopping block/counter. 11. White metal side table. Just picked up one myself at an estate sale for $3 bucks! However, mine is not in the pristine rusty condition that yours is in. Unfortunately, it is in “mint” condition with only a scrape or two here and there. I’ve got to remedy that with some sand paper and a dry brush paint job perhaps in gray to go with my beach inspired bedroom as a side table by the bed. Then again I could also use it on my deck to serve drinks. 7. Toilet. Sorry. In my book a toilet is just a toilet and that’s all it was ever meant to be. Unless, however, you own a plumbing company and want to throw a hunk of wood or glass on it to make a table in your showroom. Other than that, people recycle those for bathroom use only. I’m begging you! I had a friend who had an old fridge that didn’t work and she used it like a wardrobe in her bedroom. It would make great storage in a kitchen if you didn’t have a pantry or to put dishware in. I think the old jack would make a really cool base for a mailbox, specifically my mailbox ~ lol That fridge is amazing. Must have been the cream of the crop at the time. I wonder how well they work? 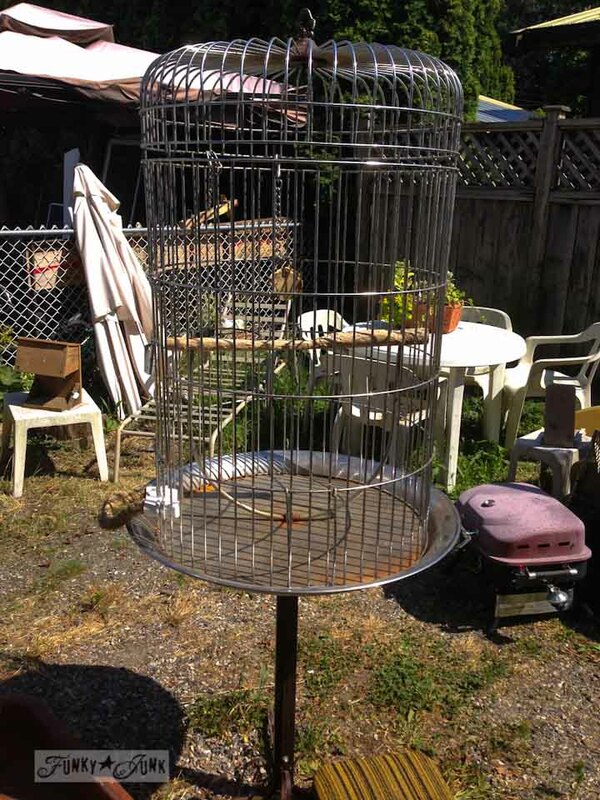 I used a “massive” bird cage in my back yard as a trellis for bird house gourds to grow over. Looked good & plenty of room, plus still able to reach all the gourds as they covered the wire. Oh my… now THAT idea is cool! I see this as a barstool…just need two more! A few garbage days ago someone was throwing out the white metal table #11. I walked past it while I was walking my dog then I went back & brought it home. I cleaned it up and now it’s in my kitchen as a shelving unit – the wheels give it mobility to use anywhere I need it. It holds the items that I use everyday. Mine isn’t as rusty as #11 – it’s a beautiful white with wheat stalks painted in orange in the corners.